Early onset Alzheimer’s disease is not typically associated with older adults aged 65+. That age group is diagnosed with the full-blown version of this terrible illness. In facet, the early onset most often occurs in adults younger than 65 years of age. Alzheimer’s is a degenerative disease, which means it will only get worse over time. Major declines occur in the form of memory loss, overall cognitive decline, depression, mood swings, and sleep cycle disruptions. Researchers do not know why Alzheimer’s develops at an early age in some people. They have however, identified Alzheimer’s symptoms in people in their 30s, 40s, and 50s. 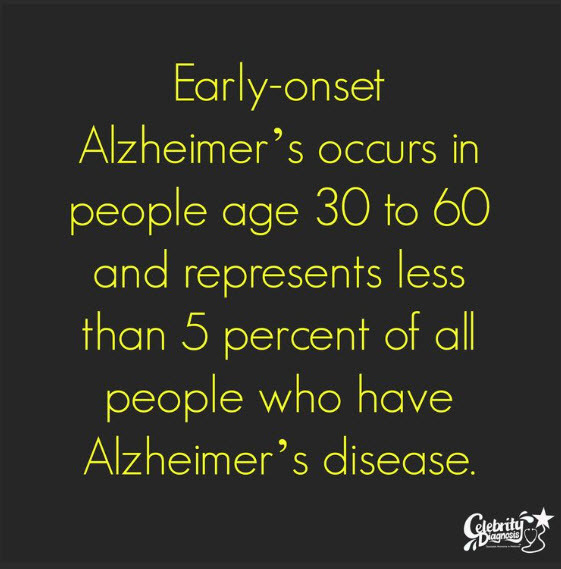 According to the Alzheimer’s Association, Alzheimer’s accounts for 60 to 80 percent of all known dementia cases. At this time there is no cure, but some treatments can ease symptoms and delay its progression. There are several distinct symptoms of memory loss that may indicate Alzheimer’s. If your loved experiences one or more, see your doctor. A person with early-onset Alzheimer’s will have more noticeable memory loss and may repeatedly forget the same information. Another symptom displayed by people with early onset is constant difficulty to complete simple tasks. A fitting example is if a person has used the same phone for years and suddenly cannot remember how to use the phone. Previously familiar places are now unknown and perceived as brand new locations. They also experience may have trouble keeping track of the day of the week, seasons, months, or time of day. A person with Alzheimer’s can repeatedly forget where they placed an item, especially if they put it in an unusual place. Alzheimer’s also makes it difficult for a person to retrace their steps to find the missing item. This can be distressing and may cause the person to believe someone is stealing from them. Everyone makes bad decisions at times. People with early-onset Alzheimer’s, however, may display a marked change in their ability to make good decisions. In ear onset Alzheimer’s the person easily becomes confused, anxious, suspicious, or depressed. They may show these signs in a variety of settings, including at work, at home, and in unfamiliar places. As there is no cure at this time, treatment focuses on managing symptoms and maintaining a reasonably good quality of life.